The church of Soccorso is located at the peak of the sea in Forio. It is dedicated to Santa Maria della neve and its original religious building dates back to 1350 used as a monastery of the Augustinian Fathers who resided there until 1653. Its architecture and the position, close to the harbor, but visible from the sea at a big distance, have made this church a symbol of Forio and the island in the world. The main artistic works that we can find inside are a Cesare Calise shovel, a bowl of piperno (magma stone) of 18th century and two marble medallions coming from a medieval sarcophagus that was in the castle. It is one of the most unique architectural achievements of the island. The church can be reached by 20 stairs of piperno leading to the hall where five crosses of piperno (magma stone) are placed. The church is known all over the world not only for its location, but above all for its unique façade. It is a white and adorned with a rich stairway covered with precious majolica, depicting saints and scenes of the Passion of Christ. The style is unique: the church, even in its elegant simplicity, has byzantine architecture style, Moorish and Mediterranean architecture in a wonderful fusion of graceful and harmonious shapes. On your left you can find a chapel with a thaumaturgical Crucifix, a sculpture of the XVI century. Above the main altar you can find the 18th century wood and polychrome figure of the Madonna del Soccorso. The fabulous ceramic tiles depicting flowers and stars on the floor near the altar, give an idea of how the floor must once have looked throughout the church and create an amazing effect of colour and design, like an immense carpet. 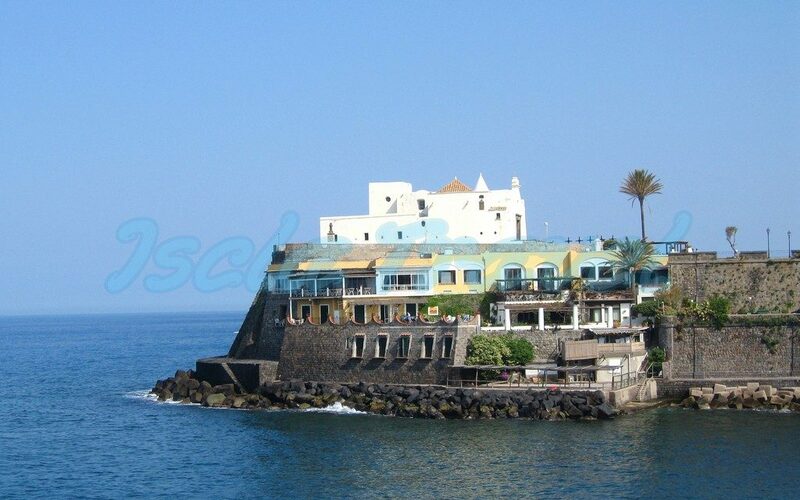 Do you want to visit "The church of Soccorso" during your holidays in Ischia?